For the past two years, an unprecedented Europe-wide public controversy about a once-unknown element in international trade agreements has kept citizens, politicians and the media on their toes. It’s all been about the so called investor-state dispute settlement system, in short, ISDS. ISDS is included in thousands of international agreements. It allows companies to sue governments if policy changes – even ones to protect public health or the environment – are deemed to affect their profits. These lawsuits bypass domestic courts and take place before an international tribunal of arbitrators, three private lawyers who decide whether private profits or public interests are more important. Across the world, investor state tribunals have granted big business billions of dollars from taxpayers’ pockets – often in compensation for public interest measures. In an attempt to get around the enormous opposition generated by ISDS, the European Commission chose a different label when, in autumn 2015, it released a revised proposal for all the EU’s ongoing and future investment negotiations, including TTIP. Instead of the ‘old’ ISDS system, the Commission promised a ‘new’ and allegedly independent system, supposed to protect governments’ right to regulate: the Investment Court System or ICS. The analysis in this report shows that the proposed ICS does not put an end to ISDS. Quite the opposite, it would empower thousands of companies to circumvent national legal systems and sue governments in parallel tribunals if laws and regulations undercut their ability to make money. It would pave the way for billions in taxpayer money being paid out to big business. It could curtail desirable policymaking to protect people and the planet. And it threatens to lock EU member states forever into the injustices of the ISDS regime. 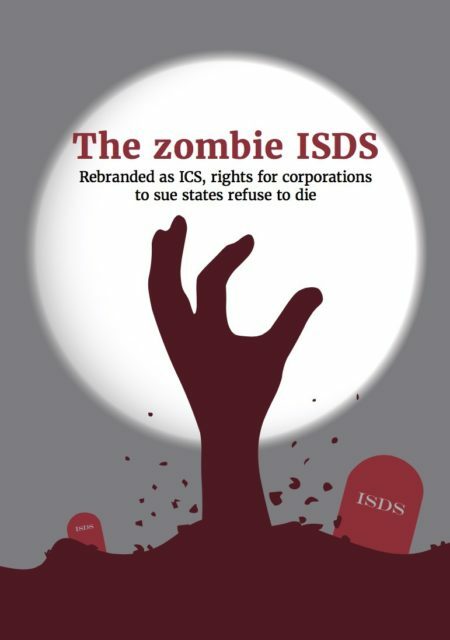 In a nutshell, the proposed ‘new’ ICS is ISDS back from the dead. It’s the zombie ISDS.